The narrow country lane wound it’s way to Gittisham where I found signs pointing the way to Combe House Hotel, which is a large Elizabethan home that became the magnificent backdrop for the grazing Arabian mares and their foals. Mares and foals greet visitors as they collect for the day. The Open Day and Sale listed a start time of 2 pm however I arrived about 10 minutes after that and found that many cars were already crowded along the long driveway leading up to the Combe House Hotel. There, in front of this hotel, was a large band of mares and foals, roaming freely and grazing merrily in an enormous field. Amongst the mares and foals were the throng of visitors, like myself. Combe Farm host Michael Harris mingled with the visitors, greeting everyone cheerfully, acknowledging returning guests from previous years ‘Open days’ as he passed out the schedule and sales list. Simultaneously, several of the female grooms were answering questions, mostly to identify mares and foals for the numerous guests. I estimated that about 150 people were present that day. Stallions were presented on the lawn outside the stallion barn. I was happy to see the day’s proceedings occur in a smooth, relaxed format whilst still being professional. 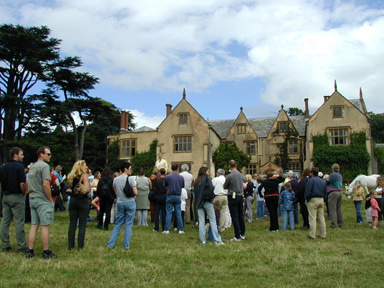 Of course, we have all been to events that seemed rushed and chaotic, but the Open Day at Combe Farm was far from that sort. The day was dreary and grey, threatening rain, but it was not cold, and despite the few moments where I could feel a few spits of rain, happily the weather held and later in the day the sun shone and stayed out for the late afternoon serving of cream tea. At 2 pm, two grey mares were ridden for display, and were: 1) in English attire was the 8 year old, The Gilded Orchid (Madour x Gilded Lily by Argos); and 2) in native costume attire was 16 year old Amaryllis Belladonna (Prince of Orange x Gilded Lily). The two riders were Catherine Williams and Sasha Lawton. It was delightful to see the foals roaming loosely, up close, natural, cleaned-up, but not shaved! 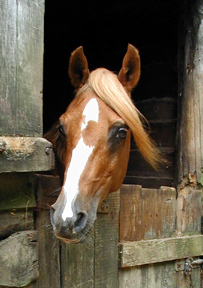 Horses need their protective face and ear hair! Yes, they might have some hair that has not yet fallen off their under bellies (from the colder days living outside), but these foals were are not wild! Far from it – these foals have been handled, groomed, and taught to lead. The mares and foals were very people-oriented, and you can tell that they are loved. 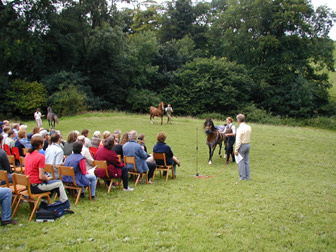 Many a guest spent time scratching and cooing over the foals before the horse presentation started. Nothing was hidden away – ask any groom for details and they readily and happily gave you the horse’s name as well as sire and dams. Simultaneously, punch and water was being served via a canteen table set up in the same field. 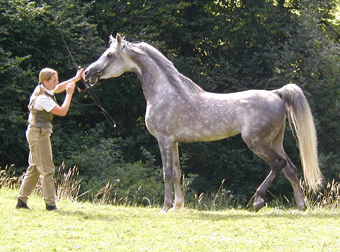 Da Vinci (Crusader x Mazourka) grey stallion. It seemed that this stud was just what I had hoped to see: hands on grooms, hands-on horses, all in a friendly, open and relaxed manner. A lovely way to spend an afternoon, taking in the rolling hillsides of the stud that give way to beautiful views of the Devon countryside. At about half past two, Michael formally welcomed his guests. From his talk, some of the primary points that he rekated were his belief that you can only breed good horses from good mares. 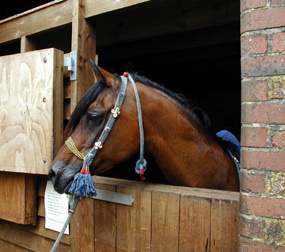 Michael also stressed that at Combe Farm, much attention is given to the early handling of the foals, which he says reflects in their friendly attitude toward people. From what I understand, host Michael Harris began breeding Thoroughbred horses, and bred the mare Welsh Blossom who held a track record at Newmarket. 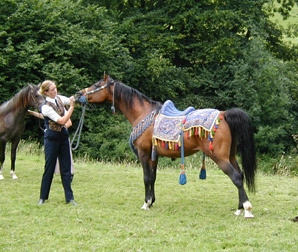 His Arabian program began with Old English lines crossed on Polish via Argos. 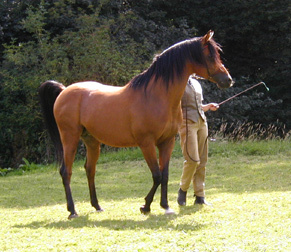 Currently he uses the Polish stallion Wermut, the Egyptian stallion Shaka (Shanin x AK Kastana) and the Russian stallion Rumak (Partner x Rucasja). Michael’s foundation stallions, Prince of Orange (Roxan x Corn Marigold) is of Crabbet/Old English lines, and his half-Polish stallion Hawk Moth (Argos x Sapphire Blue) still figures prominently in his breeding program. Hawk Moth (Argos x Sapphire Blue) head study of the Combe Farm foundation stallion. 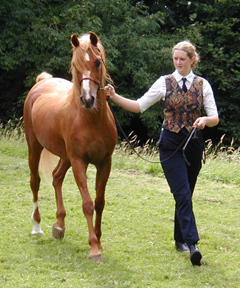 As a speaker, Michael related many experiences about his training and breeding program, using layman’s terms, while providing examples that non-horse people could understand. This is very helpful to those just considering buying a horse, but it also demonstrates Michael’s own people skills as a promoter of the values of an Arabian horse. From Alexia Ross, who wrote: The Prince of Orange was foaled in 1975. 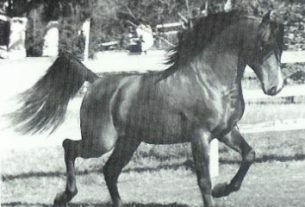 He was sired by Roxan – by Count Roland (Count D’Orsaz/Rithyana by Raktha) from Bint Roxana (Greatheart/Roxana by Ruskov). His dam was Corn Marigold – by Zehros (*Argos (imp. Polish) /Zehraa by Irex) from Schima (Kami/Rasana by Silver Vanity). That makes him actually 87.5% Old English so probably around 80% Crabbet, with the Polish Argos accounting for 12.5% of his pedigree. He probably inherited his bright chestnut pretty look from Rissla with three crosses to her beautiful son Irex (by Naseem) via Zehraa, Greatheart and Kami’s sire Iridos plus further Rissla blood via Count D’Orsaz (by Rissalix), his full sister Kabara (Kami’s dam) and Rasana’s dam Risseefa (Faris/Risira – Naziri/Rislina – Rafeef/Rissla. 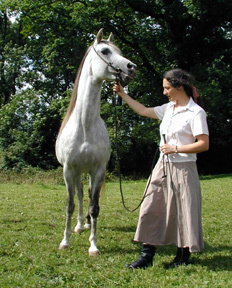 Rasana was actually a full sister to Rosemary Archer’s Silver Ripple). A Kehailan Rodan Ibn Rualla tracing to Rodania DB in the tale female line via Rissla. The Prince of Orange, Catherine Williams handler. 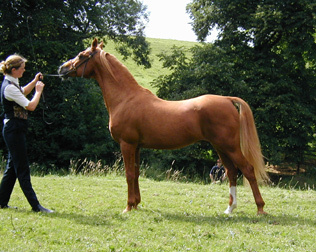 The Prince of Orange (Roxan x Corn Marigold) shown here at age 26. Catherine Williams handler. Two horses, one an Anglo-Arab named Savannah Wind, the other a Thoroughbred named Miss Sousie, were ridden in-front of the visitors, taken down a long hill and then trotted back up the hill. This journey was repeated again only the second time they both galloped back up the hill toward the crowds. 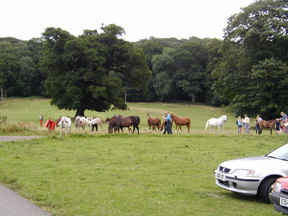 At this point, Michael escorted the visitors across the mare and foal field to see the yearling colts, who were waiting to be viewed in a large adjacent paddock. Afterwards, we journeyed toward the stallion barns where there was a small paddock lined with rows of chairs for the in-hand presentation of sale horses. Shaka (Shanin x AK Kastana) Gray Egyptian Arabian stallion. Stallions were presented with one or more of their get. This format of presentation followed for these Combe Farm stallions: Hawk Moth, The Prince of Orange, Da Vinci (Crusader x Mazourka), Shaka, and the latest addition to the stallion string, World Champion Rumak. Lord Darcy (Da Vinci x Polly Marie) a 4 year old stallion that was presented for sale. Because of these blends of bloodlines, there are different characteristics showing in the Combe Farm herd. However, I was very impressed with the overall consistency of good qualities. 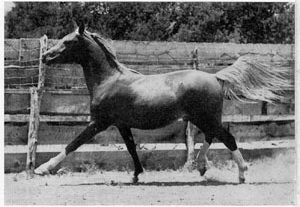 The majority of Michael’s horses have all the desirable Arabian qualities of pretty faces, large eyes, good length of neck with clean throat latch, short strong backs, and good limbs. 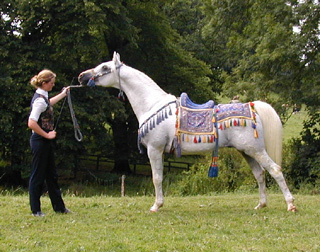 Arabian natural tail carriage was also present as well as good movement. Some of his horses were of the stockier build known in some Polish lines. 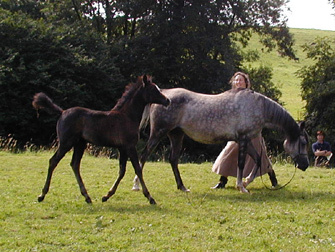 Horses ranged in sizes, with most in the 14.3 hand range. A few individuals were taller. 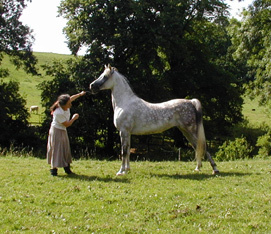 The farm does have several Anglo-Arabs for sale, as well as several Thoroughbreds. Nicknamed Mini Moth, this 2 year old colt is by Hawk Moth x Salome Bint Samiha. This horse has beautiful movement and strutted his stuff at liberty. My digital camera is not good at getting action shots, but I can vouch for his lovely movement. I came away convinced that Michael has a successful program breeding Arabians of consistent quality, and not just horses for either halter or riding. His Arabians could go either route, as they have definite Arabian type and character. Yet, Michael has not bred away from strong correct bodies and limbs useful for ridden competition. His use of different lines that are blended together improves what an individual ‘straight’ program might lack. If you missed this year’s Open Day at Combe Farm, I am told there will be another September 23, 2001, so you won’t have to wait till next year! 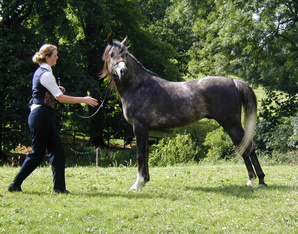 Kossak (Kulak x Holly Blue), an athletic stallion offered for sale. 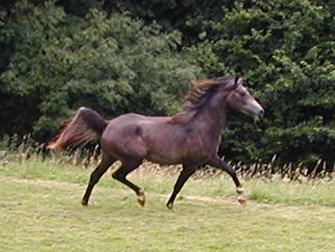 The mare, Winter Persephone (Shapoor x Grey Wood Nymph – British National Champion) herself a Res. Champion Foal at Haywood with her Shaka filly.